Alexios I Komnenos (Greek: Ἀλέξιος Αʹ Κομνηνός, 1048 or 1056 – 15 August 1118), was Byzantine emperor from 1081 to 1118. Although he was not the founder of the Komnenian dynasty, it was during his reign that the Komnenos family came to full power. Inheriting a collapsing empire and faced with constant warfare during his reign against both the Seljuq Turks in Asia Minor and the Normans in the western Balkans, Alexios was able to curb the Byzantine decline and begin the military, financial, and territorial recovery known as the Komnenian restoration. The basis for this recovery were various reforms initiated by Alexios. His appeals to Western Europe for help against the Turks were also the catalyst that likely contributed to the convoking of the Crusades. Alexios was the son of the Domestic of the Schools John Komnenos and Anna Dalassena, and the nephew of Isaac I Komnenos (emperor 1057–1059). Alexios' father declined the throne on the abdication of Isaac, who was thus succeeded by four emperors of other families between 1059 and 1081. Under one of these emperors, Romanos IV Diogenes (1067–1071), Alexios served with distinction against the Seljuq Turks. 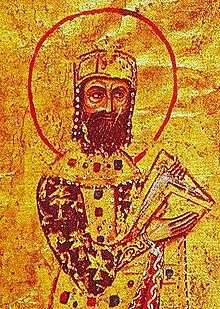 Under Michael VII Doukas Parapinakes (1071–1078) and Nikephoros III Botaneiates (1078–1081), he was also employed, along with his elder brother Isaac, against rebels in Asia Minor, Thrace, and in Epirus. While Byzantine troops were assembling for the expedition, the Doukas faction at court approached Alexios and convinced him to join a conspiracy against Nikephoros III. The mother of Alexios, Anna Dalassena, was to play a prominent role in this coup d'état of 1081, along with the current empress, Maria of Alania. First married to Michael VII Doukas and secondly to Nikephoros III Botaneiates, she was preoccupied with the future of her son by Michael VII, Constantine Doukas. Nikephoros III intended to leave the throne to one of his close relatives, and this resulted in Maria's ambivalence and alliance with the Komnenoi, though the real driving force behind this political alliance was Anna Dalassena. For more details on this topic, see Byzantine-Norman Wars. By the time Alexios ascended the throne, the Seljuqs had taken most of Asia Minor. Alexios was able to secure much of the coastal regions by sending peasant soldiers to raid the Seljuq camps, but these victories were unable to stop the Turks altogether. As early as 1090, Alexios had taken reconciliatory measures towards the Papacy, with the intention of seeking western support against the Seljuqs. In 1095 his ambassadors appeared before Pope Urban II at the Council of Piacenza. 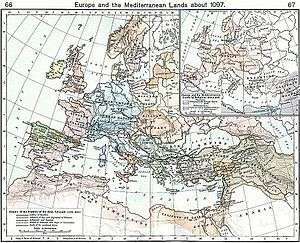 The help he sought from the West was simply some mercenary forces, not the immense hosts that arrived, to his consternation and embarrassment, after the pope preached the First Crusade at the Council of Clermont later that same year. Not quite ready to supply this number of people as they traversed his territories, the emperor saw his Balkan possessions subjected to further pillage at the hands of his own allies. Alexios dealt with the first disorganized group of Crusaders, led by the preacher Peter the Hermit, by sending them on to Asia Minor, where they were massacred by the Turks in 1096. The second and much more formidable host of crusaders gradually made its way to Constantinople, led in sections by Godfrey of Bouillon, Bohemond of Taranto, Raymond IV of Toulouse, and other important members of the western nobility. Alexios used the opportunity to meet the crusader leaders separately as they arrived, extracting from them oaths of homage and the promise to turn over conquered lands to the Byzantine Empire. Transferring each contingent into Asia, Alexios promised to supply them with provisions in return for their oaths of homage. The crusade was a notable success for Byzantium, as Alexios recovered a number of important cities and islands. The siege of Nicaea by the crusaders forced the city to surrender to the emperor in 1097, and the subsequent crusader victory at Dorylaion allowed the Byzantine forces to recover much of western Asia Minor. John Doukas re-established Byzantine rule in Chios, Rhodes, Smyrna, Ephesus, Sardis, and Philadelphia in 1097–1099. This success is ascribed by Alexios' daughter Anna to his policy and diplomacy, but by the Latin historians of the crusade to his treachery and deception. In 1099, a Byzantine fleet of ten ships was sent to assist the crusaders in capturing Laodicea and other coastal towns as far as Tripoli. The crusaders believed their oaths were made invalid when the Byzantine contingent under Tatikios failed to help them during the siege of Antioch; Bohemund, who had set himself up as Prince of Antioch, briefly went to war with Alexios in the Balkans, but he was blockaded by the Byzantine forces and agreed to become a vassal of Alexios by the Treaty of Devol in 1108. During the last twenty years of his life Alexios lost much of his popularity. The years were marked by persecution of the followers of the Paulician and Bogomil heresies—one of his last acts was to publicly burn at the stake Basil, a Bogomil leader, with whom he had engaged in a theological dispute. In spite of the success of the crusade, Alexios also had to repel numerous attempts on his territory by the Seljuqs in 1110–1117. Alexios was for many years under the strong influence of an eminence grise, his mother Anna Dalassene, a wise and immensely able politician whom, in a uniquely irregular fashion, he had crowned as Augusta instead of the rightful claimant to the title, his wife Irene Doukaina. Dalassena was the effective administrator of the Empire during Alexios' long absences in military campaigns: she was constantly at odds with her daughter-in-law and had assumed total responsibility for the upbringing and education of her granddaughter Anna Komnene. Manuel I Comnenus scyphate (cup-shaped) hyperpyron. Under Alexius I Comnenus the debased solidus (tetarteron and histamenon) was discontinued and a gold coinage of higher fineness (generally .900–.950) was established in 1092, commonly called the hyperpyron at 4.45 grs. The hyperpyron was slightly smaller than the solidus. It was introduced along with the electrum aspron trachy worth a third of a hyperpyron and about 25% gold and 75% silver, the billon aspron trachy or stamenon  valued at 48 to the hyperpyron and with 7% silver wash and the copper tetarteron and noummion worth 18 and 36 to the billon aspron trachy. Alexius' reform of the Byzantine monetary system in 1092 was an important basis for the financial recovery and therefore supported the so-called Komnenian restoration, as the new coinage restored financial confidence. Alexios I had overcome a dangerous crisis and stabilized the Byzantine Empire, inaugurating a century of imperial prosperity and success. He had also profoundly altered the nature of the Byzantine government. By seeking close alliances with powerful noble families, Alexios put an end to the tradition of imperial exclusivity and coopted most of the nobility into his extended family and, through it, his government. Those who did not become part of this extended family were deprived of power and prestige. This measure, which was intended to diminish opposition, was paralleled by the introduction of new courtly dignities, like that of panhypersebastos given to Nikephoros Bryennios, or that of sebastokrator given to the emperor's brother Isaac Komnenos. Although this policy met with initial success, it gradually undermined the relative effectiveness of imperial bureaucracy by placing family connections over merit. Alexios' policy of integration of the nobility bore the fruit of continuity: every Byzantine emperor who reigned after Alexios I Komnenos was related to him by either descent or marriage. Anna Komnene, who married the Caesar Nikephoros Bryennios the Younger. Maria Komnene, who married (1) Gregory Gabras and (2) Nikephoros Katakalon. John II Komnenos, who succeeded as emperor. Andronikos Komnenos, sebastokrator. Died in battle 1117 (Battle of Philomelion). Eudokia Komnene, who married Michael Iasites. Theodora Komnene, who married (1) Constantine Kourtikes and (2) Constantine Angelos. By him she was the grandmother of Emperors Isaac II Angelos and Alexios III Angelos. ↑ Sewter 1969, pp. 481-487. ↑ "Archived copy". Archived from the original on August 7, 2007. Retrieved November 14, 2015.